Wraps aren't really the ideal food for winter... usually the winter months should be full of hot panninis, soups and warm comfort foods. But since I'm trying to stick to some sort of a new year resolution of eating healthier, I decided to bring some pesto back into my life and test out a new wrap idea I had in mind. I used this pesto recipe here if you don't already have your own way of making it. PS- You can always substitute the pine nuts for walnuts when making pesto. PPS- This isn't my finished product's photo. Ever notice how messy a wrap turns out? It's certainly never photogenic! 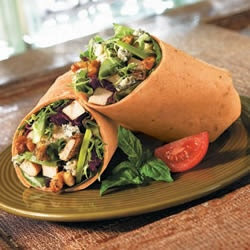 Mix chicken pieces in a bowl of pesto and wrap--along with the rest of the ingredients-- into the spinach wrap and serve. now THIS looks amazing. i need to start making wraps; it's a great way to avoid bread and i somehow always forget about it!